Fortunately I made it back to Portsalon on Friday 18th, as I'd hoped. 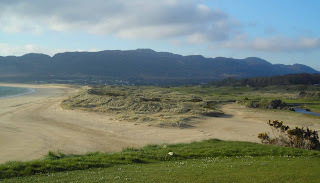 It was Dunfanaghy in the morning - a true test of links golf that will require every bump and run skill you possess - and then a trip to Portsalon to experience a superb opening stretch of opening holes. I've attached a pic of the 14th, Matterhorn, another beautiful but terrifying hole that drives over the 13th green - the flag is not visible in the pic, but a small yellow post can be seen in the middle of the pic, and the green is beyond that, in front of what looks like a white dot. Yes, it was a beautiful day, but brutally cold. While I played a select 9 holes (1-6, 13, 14 and 18), my wife walked our dogs on the stretch of beach that is also attached. 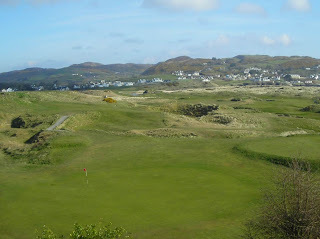 It is a beautiful spot, aside from the holiday houses, and is one of those colourful courses that thrills every step of the way. Bandwagoner's Guide to Golf – Bandwagoning the birdies, the bogeys and everything in between. Places in Ireland you must see before you die.Places in Ireland you must see before you die.